Joanne Frost (born (1971-06-27)27 June 1971) is an English television personality, nanny and author who is best known for the reality television programme Supernanny UK, in which she was the central figure. The show first aired in the United Kingdom in 2004 and she has branched off into several other reality shows in the United Kingdom, United States and the Netherlands. The edgier Family S.O.S. with Jo Frost addressed issues such as addiction and abuse. Family Matters is a talk show. She has written six books on child care. Frost grew up with one brother in Southwest London. Her father was an English builder and her mother, born in Gibraltar, was an interior decorator. Frost had a happy, physically active childhood. Because her father was interested in history, she frequented a number of castles and museums as a child. In 1994, her mother died of cancer. Frost, who regularly travels for work, lived with her father when she was not taping or meeting other career obligations. As of 2014, she is living with her husband, location coordinator Darrin Jackson, in Orange County, California. Frost worked as a nanny for 30 years, beginning in 1989, when she was 18 years of age. She was employed in the United Kingdom and the United States and Frost's clients included celebrities such as John Lloyd, a television producer. Frost was hired for the Channel 4's Supernanny television show that launched in the United Kingdom in 2004. In each episode she visited a family and implemented consistent disciplinary, behavioral, and entertainment techniques to improve troubled families’ lives. In their book Handbook of Psychological Assessment, Case Conceptualization, and Treatment, Children and Adolescents, Michel Hersen and David Reitman state, "With considerable skill, Super Nanny Jo Frost implements standard, evidence-based contingency management procedures, as well as heavy evidence of creating alternative positive activity structures." The show has had its critics, and not all child-care experts agree with her approach. Some people find that the children's right to privacy has been violated and that children are embarrassed when put on the "naughty step". Newcastle University media and cultural-studies lecturer Tracey Jensen believes that the format results in the mother being "shamed before she is transformed". The show, viewed by six million people in its first year, was an "instant success." Shows were created in 48 countries by 2014 that were tailored after Supernanny. The UK show ran six seasons. The United States version aired on ABC. Like the UK version, the American Supernanny was also a success and garnered Frost invitations to The David Letterman Show, The Oprah Winfrey Show, and The Tonight Show with Jay Leno. In 2011, Frost quit Supernanny, and Deborah Tillman, who ran a group of play schools, was hired as her replacement for the United States show. Frost commented at the time, "I am not at all happy. I feel like I worked really hard to get where I am. I am Supernanny." Jo Frost: Extreme Parental Guidance aired in the UK for Channel 4 beginning in 2010. It had an issue-based format, with limited home visits. Family S.O.S. with Jo Frost premiered 28 May 2013, on TLC in the United States with a 90-minute episode. Supernanny focused on discipline issues, but Family S.O.S. tackled serious, complex issues, such as blended families, addiction, abuse, and marital problems in family's homes. TV critic Hank Stuever commented, "For all its noise and uncomfy moments, Family S.O.S. is relatively genuine stuff, especially for the current incarnation of TLC. Viewers who know Frost's previous work will have no trouble believing that she cares about the outcome and sincerely wants to help these families patch things up." Frost was one of the executive producers for the show. Beginning 18 April 2014, she hosted the talk show Family Matters for ITV. Prior to the show, families underwent taped interviews about the nature of their difficulties, to be addressed during the talk show. The show relied on Frost's intuition and experience to resolve difficult situations, sometimes dealing with parents more directly than she may have done in other shows. Over time, Frost has softened her image, including stopping her common gesture of pointing her finger at people, and stopped wearing severe suits, both of which had been iconic during her time on Supernanny. Twofour Broadcast planned in July 2014 for a new UK show with Frost that would "help to restore harmony and balance to their family life" over the course of a family retreat. It was announced in January 2015 that Frost's production company, Nanny Jo Productions, partnered with Strix Television to produce Nanny on Tour. Based in the Netherlands, Frost will travel across the country helping families. An American version debuted on Up TV on 28 January 2016 for a 10-week run. Frost is an advocate for the United Nations Foundation's [email protected] movement, which aims to decrease vaccine-preventable childhood diseases and deaths. In March 2015, she visited legislators at Capitol Hill to show her support for the movement. Frost operates a blog to promote vaccination of children and is one of the celebrities that has shown her support for #Givingtuesday, the International Day of Giving. She speaks on parental and familial issues. Frost also is an active supporter for those who live with anaphylaxis and life-threatening allergies, and is the 2014 ambassador for FARE (Food, Allergy, Research and Education) and an activist for children of neglect and poverty. Jo Frost (2005). Supernanny: How to Get the Best from Your Children. London: Hodder. ISBN 0-340-89516-0. Jo Frost (2006). Ask Supernanny: What Every Parent Wants to Know. London: Hodder Mobius. ISBN 0-340-92132-3. Jo Frost (2007). Jo Frost's Confident Baby Care. London: Orion. ISBN 0-7528-8855-2. 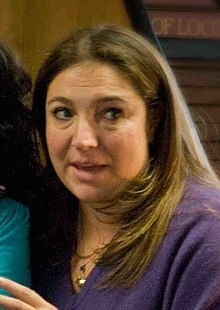 Jo Frost (2011). Jo Frost's Confident Toddler Care. London: Orion. ISBN 1-4091-1334-5. Jo Frost (2013). Jo Frost's Toddler SOS. London: Orion. ISBN 0-7528-9864-7. Jo Frost (2014). Jo Frost's Toddler Rules. New York: Ballantine Books. ISBN 0-345-54238-X. ^ "Today in History". Associated Press. 27 June 2014. Archived from the original on 24 September 2015. Retrieved 18 March 2015 – via HighBeam. (Subscription required (help)). ^ "Jo Frost". TVGuide.com. Archived from the original on 10 September 2015. Retrieved 21 January 2016. ^ Philby, Charlotte. "Frost, Jo". ISNI Authority Control. Retrieved 18 March 2015. ^ a b Calhoun, Ada (16 October 2005). "Supercalanormalistic". The New York Times. Retrieved 18 March 2015. ^ a b c d e f g h i j k l Sean Macaulay (28 January 2010). "Jo Frost interview: How a nanny from South London went on to become an Oprah-approved, world famous, multimillionaire childcare phenomenon". The Telegraph. Telegraph Media Group Limited. Retrieved 18 March 2015. ^ a b c Philby, Charlotte (10 March 2013). "Jo Frost: 'I've had some real head-on situations with the fathers'". The Independent. UK. Retrieved 18 March 2015. ^ a b c d e Gordon, Byrony (13 September 2014). "Jo Frost interview: The day Supernanny came to tea". The Daily Telegraph. UK: Telegraph Media Group Limited. Retrieved 18 March 2015. ^ a b "Families Wanted for New TV Show". Dispatch. Hucknall, England: Johnston Publishing Ltd. 23 July 2014. Archived from the original on 24 September 2015. Retrieved 18 March 2015 – via HighBeam. (Subscription required (help)). ^ Michel Hersen; David Reitman (13 May 2008). Handbook of Psychological Assessment, Case Conceptualization, and Treatment, Children and Adolescents. John Wiley & Sons. p. 333. ISBN 978-0-470-17357-2. ^ a b Campbell, Alex (3 May 2013). "Six childcare gurus who have changed parenting". BBC News. Retrieved 18 March 2015. ^ Duerden, Nick (8 September 2007). "Jo Frost: Nanny state". BBC News. Retrieved 18 March 2015. ^ "Supernanny TV Episodes". Supernanny TV Series, UK, Ricochet Limited. Retrieved 18 March 2015. ^ Churcher, Sharon; Graham, Caroline (26 November 2011). "Why Supernanny wants to put TV bosses on the naughty step: Jo Frost quits show and is replaced by Michelle Obama lookalike who trained as an accountant". Daily Mail. Retrieved 18 March 2015. ^ Preston, John (10 February 2010). "Jo Frost: Extreme Parental Guidance, Channel 4, review". The Daily Telegraph. UK: Telegraph Media Group. Retrieved 18 March 2015. ^ a b Raeside, Julia (5 July 2011). "TV Highlights — Jul 6th". The Guardian. London. Retrieved 18 March 2015. ^ a b c Stuever, Hank (27 May 2013). "TLC's 'Family S.O.S. ': Supernanny Jo Frost returns to the unhappiest of homes". The Washington Post. Retrieved 25 May 2013. ^ "Family S.O.S. with Jo Frost". The New York Times. Retrieved 18 May 2015. ^ a b "Prince George's parents love Supernanny Jo Frost!". LTV.com. 4 May 2014. Retrieved 18 March 2015. ^ "Frost Is Forecast Again; TV Interview: Parenting Guru Jo Frost Is Tackling Grown-Ups as Well as Kids in Her New Daytime Talk Show. She Talks Fraught Families, Famous Fans and Reveals That Even Supernanny Lets Her Hair Down Sometimes". Daily Record. Glasgow, Scotland: MGN Ltd. 26 April 2014. Retrieved 19 March 2015. ^ a b c Preston, John (19 January 2015). "In brief: Simon Cowell & Supernanny". Broadcast Now. Telegraph Media Group. Retrieved 19 March 2015. ^ a b Heil, Emily (14 December 2012). "Cause Celeb: former 'Supernanny' Jo Frost lobbies Hill on vaccinations". Washington Post. Retrieved 18 March 2015. ^ "Jo Frost Encourages Everyone to Support Global Childhood Vaccines on #GivingTuesday through the United Nations Foundation's [email protected] Campaign". Vaccine Weekly. 10 December 2014. Archived from the original on 2 April 2015. Retrieved 18 March 2015 – via HighBeam. (Subscription required (help)). ^ a b "Food Allergy Research & Education" (Press release). FoodAllergy.org. 6 August 2014. Retrieved 2015-03-18. ^ "A Conversation with Jo Frost, National Ambassador for the FARE Walk for Food Allergy". FoodAllergy.org. 21 September 2014. Retrieved 2015-03-18. ^ "Jo Frost on Britain's Killer Kids". Crime and Investigation. Retrieved 2018-08-18. Wikimedia Commons has media related to Jo Frost.